Covering an impressive range of super telephoto focal lengths, the Canon EF-mount APO 300-800mm f/5.6 EX DG HSM from Sigma is a sophisticated zoom characterized by its advanced optics and constant f/5.6 maximum aperture. Designated an apochromat, this lens uses a pair of extra-low dispersion elements to effectively eliminate color fringing and chromatic aberrations for high clarity and color accuracy throughout the zoom range. A multi-layer coating has also been applied to lens elements to control flare and ghosting for improved contrast and clarity. Benefitting the optical attributes is a Hyper Sonic Motor, which provides quick, smooth, and quiet autofocus performance with full-time manual focus override. The physical design also incorporates a fixed, rotating tripod collar for easy attachment to a tripod or monopod, and a drop-in filter slot permits working with rear 46mm filters, such as the included circular polarizer filter. 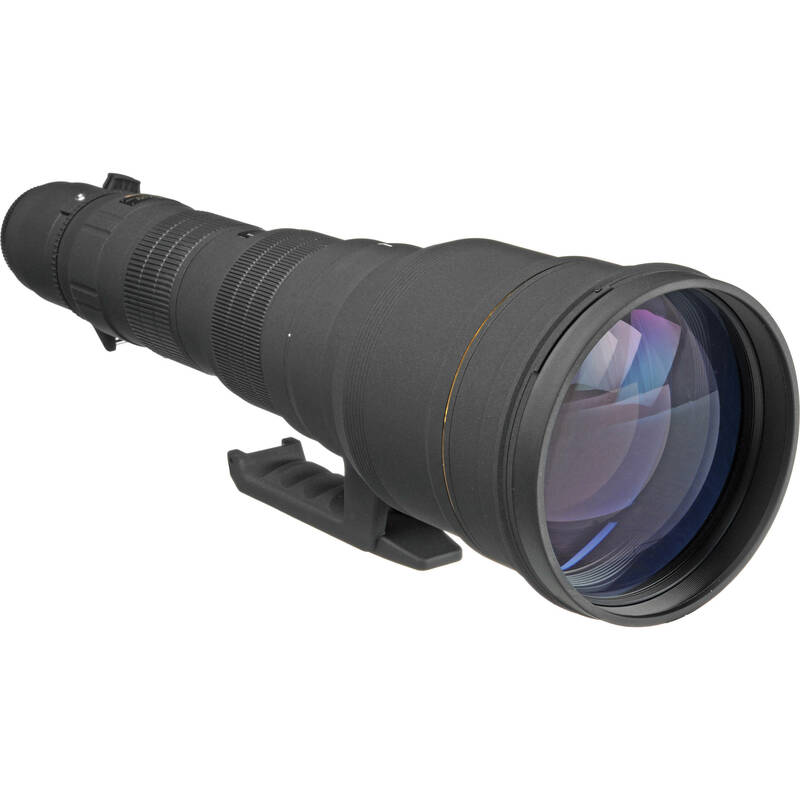 Super telephoto zoom is designed for full-frame Canon EF-mount cameras, however can also be used with APS-C models where it will provide a 480-1280mm equivalent focal length range. Apochromatic optical design utilizes two extra-low dispersion elements to significantly reduce color fringing and chromatic aberrations for increased clarity and color fidelity. Multi-layer coating has been applied to individual elements to minimize flare and ghosting for improved contrast and color accuracy when working in strong lighting conditions. Hyper Sonic Motor (HSM) realizes quick and quiet autofocus performance as well as full-time manual focus override. Internal focusing and zooming design maintains the overall length of the lens during use and also promotes faster performance. A fixed, rotating tripod collar offers well-balanced support for photographing atop a tripod or monopod with either vertical or horizontal shooting orientations. Rear drop-in 46mm filters can be used and a circular polarizer filter is included for reducing reflections and increasing contrast and saturation. Compatible with optional APO 1.4x EX DG and APO 2x EX DG teleconverters. APO 300-800mm f/5.6 EX DG HSM Lens for Canon EF is rated 4.6 out of 5 by 9. Rated 5 out of 5 by Phil from Love this brute Love this lens. I'm 70, so it's a job moving it around. I have a cart for it and my tripod setup, if I have to walk any distance. Great pics, fast focus. 300mm lets you locate then zoom in. This is my stationary location lens. The 150 600mm is my walk around lens. Even have gotten 1120mm autofocus shots with Kenko 1.4 tc on 7d mark Ii, in good light. Won't work with Sigma tc. Great build quality, very nice case, great price considering the cost of Nikon and Canon which are fixed 800mm. Used FoCal software to tune with camera and Piccure+ to sharpen images. Pleasing results for this amateur. Rated 5 out of 5 by Katmai Steve from Great For Composing Wildlife Shots! This is the second one of these lenses that I have owned, one for Nikon and now the Canon version. This lens is heavy, but ruggedly built. It takes excellent photographs using the proper techniques. The 300-800mm zoom allows for easy composition of wildlife images without constantly changing your physical location. There is no Image Stabilization so the use of a sturdy tripod or some other type of sturdy support is required. On the negative, this unit is heavy, and when lighting starts to wane, then the lens is not as useful as the faster Canon lenses. All in all, I believe this to be a very good and useful lens that is a relatively good value compared to the prices of other top quality lenses. Rated 5 out of 5 by foxbat from Lives up to its reputation for quality I've had this lens for about 18 months now and it's become my go-to lens for photographing small birds. It's as sharp as a prime up to about 700mm at f/5.6. In the 700-800 range you probably want to stop it down to f/6.3 or f/7.1 to retain maximum quality. It's very big and very heavy. I mount mine on a Gitzo 5530s/Manfrotto 393. This is a perfect combination but you won't be carrying it very far and you've got to keep an eye on both ends while you're carrying it to make sure you don't knock into things. The lack of stabilization demands perfect long lens technique even at shorter focal lengths because due to the physical length of the barrel movements are amplified more than they would be with an equivalent focal length but physically shorter lens. Rated 5 out of 5 by Anonymous from In a class of it's own I have used this lens for +/-4 years for wildlife photography in primarily Zimbabwe, Botswana and Zambia. It is a heavy lens but thats what you would expect with a lens of this zoom range and speed. I have a 360 degree vehicle roof top mount for it and a heavy tripod for ground use. Sit at a waterhole with a camo net over you and you will get the most fantastic shots as the day unfolds before you. It takes pin sharp shots at all apertures and it has the range for you to not intrude on the scene. Rated 4 out of 5 by Hansen Photo from It's a beast but a lot of fun to use! I've owned this lens for about 2 years. I own a commercial photo studio and bought this lens to shoot my recreational shots of birds and wildlife. Initially I was going to buy a 600mm f/4 Canon lens (which I've used numerous times). Sometimes when shooting with the 600mm I found I was too close to my subjects and wished I could zoom out a bit. I had not even heard of the Sigma 300-800mm. When I did learn about the Sigma, the price was about the same for either lens. I decided being able to zoom and frame the image was more important than the extra stop of light and the image stabilizer. I have not regretted my decision to buy this lens. Things I love about this lens: 1. being able to frame my subjects, 2. being able to zoom out and find my subject in the view finder and then zoom in on them (useful for moving subjects), 3. prime like sharpness and contrast throughout the zoom range (even when shooting wide open), 4. works well with my Canon 1.4x extender (you lose autofocus with the 2x extender, though you can manually focus with it), 5. quick and accurate focus on my subjects (maybe that's because of the camera bodies). Things I don't like: 1. no image stabilizer, 2. no focus limiter switch (I'd give it 5 stars if it had the stabilizer and focus limiter switch), 3. the weight (you'll see why it's nicknamed the Sigmonster if you get one). You will need a good tripod and either a Wimberly or what I use (the Bogan 393 gimble head on my carbon fiber Gitzo). It comes with a good case but it's not the best if you plan doing backpacking and such with it. I have yet to buy a backpack style case for it. You will have to learn good long lens technique as there is no stabilizer to help in lower light situations. I shoot with the 1Ds Mark 2, 5D, and 5D Mark 2. Sometimes if you are tracking a bird in flight and it goes outside of your focus point(s), the lens will go way out of focus in a hurry. This is when I wish it had the focus limiter switch. You should consider getting the Lenscoat to help protect the exterior from scratches. All in all, I love this lens and don't think there is anything quite like it on the market. Rated 3 out of 5 by Anonymous from The ultimate zoom This is the ultimate zoom lens. I've had it for about 2 months now and I've generally enjoyed it. That said, I find that it is of very limited use. I reach for my 300 f/2.8 L along with 1.4x and 2.0 extenders much more frequently to cover most of this range and still be viable for handheld shots. The Sigma requires excellent lens technique. Tripod and Wimberley mount are a must. Remote shutter is also really helpful. Most disappointing is in lower light (cloudy low , not night low) or with a light breeze blowing, where this lens turns out many less keepers due to lack of IS - particularly if the subject is moving and you don't have time to let the lens settle.Ability to frame/spot with the zoom is very nice. Quality when you have everything just right is excellent - amazing when you consider the competition is mostly primes. But this thing is really heavy. You will find reasons to avoid traveling with it. If you hike with it (I have, using the Kinesis long lens pack/harness combo) you won't be taking very much else with you.Personally, I prefer the 300mm f/2.8 IS w/1.4x and 2x as it is much more versatile and light weight (hand-holdable, f/2.8 works great in low light, great autofocus, unmatched quality without extenders, excellent with, lightweight, smaller, IS etc). Another option would be the Canon 500mm f/4 IS. The 500mm quality is still excellent with the 1.4x on it and the 300mm quality is great with the 1.4x and still pretty nice with the 2x. Further, you can stack them for a really long lens (quality suffers but it still works with some post-processing). And you get IS the whole way, which is worth a lot.The Sigma is an ideal birding lens (at rest, not in flight). Also good on safari. But is a lot to spend and a lot to haul around for such a special purpose tool, particularly compared to other options out there. Unless you really need this very specific setup, I believe there are other nearly comparable products that offer more versatility and portability.It is worth noting that it is a very high quality item. Near or on par with Canon L-series stuff. Expertise: Regular Problems Encountered: Settling the lens down for maximum clarity/sharpness. Previous Equivalent Item Owned: Canon 300mm f2.8 IS, Canon 500m f4.0 IS, Canon 100-400mm IS Items I Recommend: Wimberley head - it is a must. Rated 4 out of 5 by CyberDynesystems from Amazing IQ, flexible zoom range, heavy and hard to use. SIGMA really needs to stop raising the price of this lens and add it's Optical Image Stabilization O.S.I owned this lens for two years early in it's production run. I shot it mated to then new EOS 1D MkII (which gives you an idea of when I had it)New versions have come out and the price keeps going up (I beleive it was originally approx $$new) but nothing has been added, ( DG version added only new optical coatings, etc. )SIGMA really is an innvovator with lenses like this, the 120-300mm f/2.8, 100-300mm f/4, and now the new super fast f/2 and f/1.8 ART zooms, they literally forced Nikon and Canon to field lenses like the 200-400mm f/4This lens is exceptional in use, fast accurate AF, and the ability to Zoom in a supertelephoto like this was once unique to this lens.It's downsides are weight, and it's killing blow in a lens still being offered in 2015 is the lack of IS/OS.The one I had back in 2005-2006 woudl NOT autofocus with either a SIGMA or Canon 1.4X t-con. No expnation why, as at f/8 it should have on a 1D.I was abe to use this lens with great success on a sturdy tripod for stationary targets. It was not able to keep up with fast moving wildlife, and the lack of OS/IS forced me to sell it.Granted, today one will fair much better with better ISO noise handling in a modern DSLR, one would be able to maintain faster shutter speeds in more sitatuions to help alleviate the lack of OS.In the end the Canon 500mm f/4L IS (mkI at the time) was retained and this one sold.If SIGMA were to release an upgrade with OS like that found in the newer 120-300mm, and if the price had not gotten so far out of reach, I'd buy it again.For certain users I would defeinitely still recoemnd it. I would liek to try it again myself with a modern body that hadles high ISO settings better than my old 1D2 did. Rated 5 out of 5 by Alf. from VERY GOOD LENS My Leica camera finally died and I sold my Leica 800mm.f5.6 APO lens and purchased the 300-800mm. f5.6 EX DG APO lens to use with my old Nikon D1 cameras. Now it is used exclusively with my three D300s. With a heavy Manfrotto tripod and head #393 it is stable. Except that it has to settle when using 'movie mode' The zoom is very useful for locating moving birds and once located the autofocus works very well in reasonable light. I use it occasionally with a Nikon new 1.5 extender on my D300 cameras and it will auto-focus. It will not auto focus with the Sigma 2x but might with a Nikon x2. I prefer to use it at 800mm.and use the computer to enlarge instead of using extenders. The quality of my 8x10 prints from this lens are very good. While a very meticulous professional photographer might not find every image from this lens to satisfy, to my mind it is a wonderful lens and it goes almost everywhere with me. It has a 'lifetime warranty' here in Canada and when it came back from a trip to CA last year as 'checked luggage' with a stuck aperture, the store that I bought it from expected it to be back in a month or so. Not! It Sigma had it back in my hands within two weeks. It would be nice to have image stabilization but in two or so years even Nikon will have to have that in camera or loose business. I use this lens for bird photography. It is heavy to carry half a mile but results are great. I am very pleased with this Sigma 300-800mm. f5,6 APO lens.